If you want to pitch a science journalist, The Open Notebook has given you just that. In “Is This a Story? 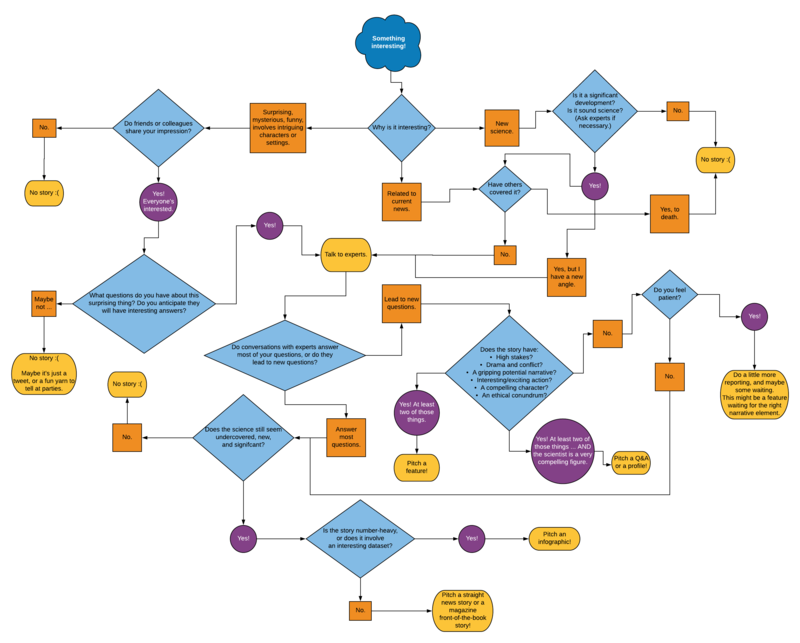 How to Evaluate Your Ideas Before You Pitch,” writer Mallory Pickett presents a decision-making flowchart for guiding freelance science journalists through vetting whether their interesting ideas can become pitches, much less published content. The flowchart is based on practices and experiences gleaned from a number of interviews with experienced journalists. Both research communicators and researchers should be using this tool to sharpen their pitches. Communicators can also use this tool as buzzkill: to walk their researchers through why what the researchers think is a story really isn’t. The path to get from “interesting” to content is steep and perilous. “Something interesting” is at least three questions and some reporting away from becoming even a pitch. As with evolution, there are a lot of dead ends. A pitch requires quite a bit of additional reporting — talking to experts beyond the potential profile subject or study author. There are no one-source (talk to a single person) stories in this flowchart. A news story about “new science” has at least as many hurdles to overcome as a potential narrative feature — not just scientific significance and freshness, but also whether the finding is heavily reliant on new numbers or a dataset. Open questions are useful. The questions that remain unanswered after the reporter talks to additional experts might be as indicative of a potential story as a pitch that has everything locked down. Now: Imagine if your research-driven organization had a similar tool to determine and sharpen the content your organization publishes in its own channels and sends to its key audiences. Because that content is at least as strategic — and often far more so — than what you pitch to a reporter or editor.